Dear Balchender ji. Thanks for your words. It motivates me to serve. The management aspect is a very tricky thing. Let me try to write something on this for you and for everyone else. Can you drop me an email as well so that I would respond as well? Very nice and informative article. 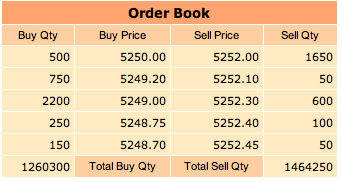 My experience is that if we are convinced to Buy a certain share/stock and if we see Total Sell far exceeding Total Buys in the ratio of 1:5 or 1:10 or more, then this should give us more confidence that the Operator/Punter is trying to influence the market by putting his large order at Upper or Lower Ceiling price so that at every small fluctuations in price he can keep on buying at his desired price. Correct me if I am wrong.